In partnership with itSM Solutions LLC and UMass Lowell a NSA/DHS National Center of Academic Excellence in Cyber Defense Research (CAE-R), LRS Education Services is proud to add the NIST Cybersecurity Framework (NCSF) cybersecurity workforce training program to our portfolio. This innovative cybersecurity workforce development program is built around the NCSF Controls Factory Model™ created by Larry Wilson, CISO of the University of Massachusetts. The itSM/UMass program teaches individuals and organizations how to protect critical assets using the NCSF. LRS Education services LIMITED OFFER for December 2017! Individuals can attend the 1-day NCSF Foundation course scheduled December 11, 2017 at no cost if they enroll in the 4-day NCSF Practitioner course December 12 – 15, 2017. Registrants will be enrolled in the NIST CSF Bootcamp. (see NIST CSF Bootcamp Course for more information). This promotion is not LRS Diamond Day or Discount eligible. The NIST CSF Foundation Certification Course outlines current cybersecurity challenges and explains how organizations that implement an NCSF program can mitigate these risks. This program is focused on candidates who need a basic understanding of the NCSF to perform their daily jobs as executives, accountants, lawyers or information technology professionals. This course is a great fit for anyone with an interest in or responsibility for the survival of the business. This includes IT, C level personnel, compliance, legal, auditing, human resources, etc. One-day, high-level overview of threats and common risks. Introduces the concepts of the NIST Framework and the Controls Factory Model. Outlines how the NIST CSF can be used to plan, implement, monitor and improve protection of critical assets. The NIST CSF Practitioner Certification Course details the current cybersecurity challenges plus teaches in depth the UMass Lowell NCSF Control Factory Methodology on how to design, build, test and manage an NCSF cybersecurity program. This program is focused on candidates who need a detailed understanding of the NCSF to perform their daily roles as cybersecurity engineers, testers or operations professionals. This course is suited for individuals working with and overseeing the technology, including CIOs, IT Directors and Managers, IT Security personnel, and IT staff. Four-day deep dive into Foundation concepts. 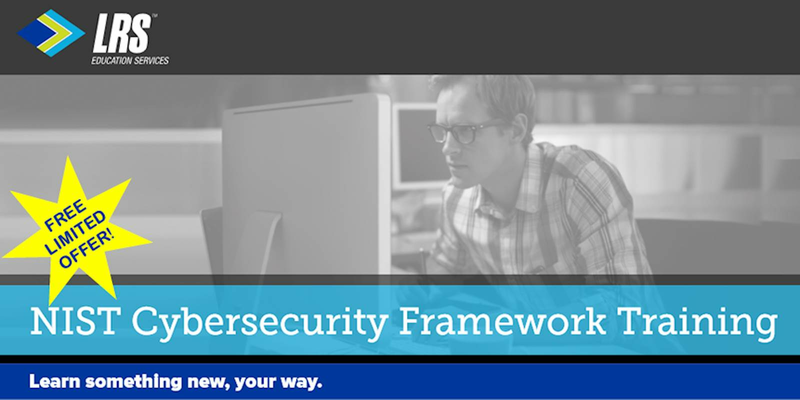 Focuses on designing and implementing (or improving) a cybersecurity program based on the NIST CSF. The NIST CSF Bootcamp Course is a combination of the Foundation and Practitioner courses and it aligns with the same audience as the Practitioner course. itSM Solutions will provide students who sign up for the LRS NCSF Instructor Led Classroom Boot Camp program scheduled December 11 – 15, 2017 in the next seven days with six months of free access (a $1695 value) to the NCSF-CFM Self-Paced Video Boot Camp Video Training Guides. Per a 2013 Executive Order from the White House the National Institute for Standards and Technology (NIST) was tasked with creating the Cybersecurity Framework to improve cybersecurity for critical infrastructure throughout the United States. This Framework contains best practices and standards from both the private sector and government. It is a guide to analyze risk and to create, implement, monitor, and continually improve a plan of action to increase cybersecurity. WHY ARE WE OFFERING THESE CLASSES? In May of 2017, a new Presidential Executive Order required all Federal agencies to use the Framework taught in these courses. Since the Framework was designed based on the best practices of both the private and public sector, it is applicable to organizations in any industry to address and manage cybersecurity risks in a cost-effective way based on business needs without placing additional regulatory requirements on businesses. Executives, managers, and IT staff all have a stake in proper cybersecurity. The NIST CSF was created to aid in understanding, implementing, monitoring, and improving cybersecurity. The framework was intentionally designed to be used by the organization as a whole. Learn more about us and our complete line of classes at www.LRSeducationservices.com, call 877.832.0688 x 1493 or send an email to GetSmart@LRS.com.